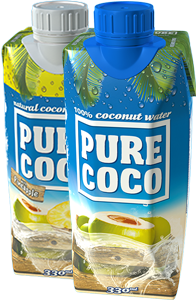 Pure Coco – 100 % coconut water is extracted from young green coconuts from the Philippines. Coconut water is one of the biggest miracle of our Planet. Coconut water is naturally filtered through the coconut´s dense fibers, contains essential electolytes, and has no fat and no cholesterol. Coconut water is perfect hydrator, with an optimal balance of Sodium and Potasium, which have complementary functions in the body, helps regulate a healthy fluid balance, burns fat faster and helps support your immune system. Coconut water is best alternative for people who like sport and want 100% natural and healthy drink. Drink coconut water before or during a workout for the natural energy you need for optimal performance. After a workout, coconut water replenishes and re-hydrates you to aide recovery. Coconut water contains electrolytes, electrolytes are minerals in your blood and other body fluids that carry an electric charge. Electrolytes affect the amount of water in your body, the acidity of your blood (pH), your muscle function, and other important processes. You lose electrolytes when you sweat. You must replace them by drinking fluids. Pure Coco has balanced proportion of electrolytes (potassium, calcium, magnesium and sodium), which bind water and hydrate your body several times as much as water and help you to perfom at your best. Just for comparison, Pure Coco coconut water has more potassium than a banana and 15 times more than most sports drinks. How do electrolytes work in your body? Sodium: control blood pressure and blood volume, sodium is needed for muscles and nerves to work properly. The coconut has innumerable health benefits; as such it is aptly called the ‘tree of life’. In fact, coconut water or the clear liquid within the fruit has been used by multiple manufacturers in the health industry as the primary ingredient for natural supplements. In times of famine and war, coconut water has been used as an intravenous fluid and saved many lives. It’s the only natural substance that can be safely injected into the human blood stream. 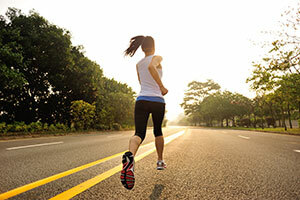 Now modern science has validated its effectiveness, especially as a natural sports drink. Hydration: Coconut water contains electrolytes; electrolytes are minerals in your blood and other body fluids that carry an electric charge. Electrolytes affect the amount of water in your body, the acidity of your blood (pH), your muscle function, and other important processes. You lose electrolytes when you sweat. You must replace them by drinking fluids. Pure Coco has balanced proportion of electrolytes (potassium, calcium, magnesium and sodium), which bind water and hydrate your body several times as much as water and help you to perfom at your best. Immune system: One of the nutrition facts of coconut water is its high levels of lauric acid, which improves the body’s defenses against disease. Lauric acid has anti-bacterial, anti-fungal and anti-viral properties that contribute to your immune system’s defense mechanism. A newborn child gets his or her lauric acid supply from breast milk to become less susceptible to disease and infections. For adults, natural coconut water is the best alternative. Aids Metabolism: Dietary pills can be replaced with this drink, too. It has the ability to trigger faster metabolism with its wealth of natural ingredients that control blood sugar. Blood sugar is not only important to diabetics but healthy people as well. With an increase in metabolic rate, your body is burning through the insulin and complex sugars faster. Coconut water is also composed of many naturally occurring bioactive enzymes (acid phosphatase, catalase, dehydrogenase, etc). In effect, these enzymes help in the digestion and metabolism. Cleanse the urinary Tract: One of the nutrition facts of coconut water is that it is a natural diuretic. As such, it helps regulate the flow of urine by increasing the rate of urination. With frequent urine flow, chances of having urinary tract infections are decreased. This natural juice drink is also a recommended remedy for bladder infections and kidney stones. Detoxification: Coconut water helps in detoxifying your body. It is referred as the strongest antidote, It has the ability to neutralize the poison effect. Coconut water contains enzymes that help to dotoxify and cleanse the digestive track. Do you want to lose weight? We are providing solution – Pure Coco. Coconut water is one of the latest health crazes to hit Hollywood and it is also calebrities secretes to lose weight. Celebrities like Madonna, Rihanna and Lady Gaga promoting coconut water. Coconut water contains a particular type of enzymes that speeds up your metabolism and actually burns more body fat! Vitamins and minerals found in coconut water make a big difference when it comes to weight loss. In particular, coconut water is very rich in magnesium, potassium, and fiber, all of which contribute to weight loss. For example, potassium helps to convert the protein we eat into muscle tissue. This is key to increasing your metabolism, as muscle mass is directly related to your resting metabolic rate. The more muscle you have, the more fat you’ll burn over the long term. Antioxidant can also help reduce the amount of fat stored in your body. As you can see, there are a lot of weight loss benefits of drinking pure coconut water. But in addition to weight loss, coconut water is also extremely hydrating and is a great addition to any health and fitness plan. In warm tropical countries, where tender coconuts are easily available, doctors often recommend a minimum of one glass of coconut water a day for pregnant women and new mum. There are many essential nutrients in it, and it has the same level of electrolytic balance that we have in our blood. It is also naturally sterile. In general, coconut water is very healthy but is even more beneficial during pregnancy. Coconut helps to maintain good health of the mother and the growing fetus. Hydratation: Because new mothers dehydrate faster and more intensely than the average person, they especially benefit from an isotonic beverage like pure young coconut water. 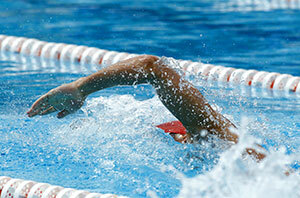 As an isotonic beverage, coconut water is absorbed by the body faster than most liquids. Immune system: Pure, natural young coconut water is unique in that it contains lauric acid. Lauric acid is a valuable ingredient in breast milk that introduces antimicrobial, antiviral, and antifungal properties – this protects and promotes the health of both the new mother and, when applicable, her nursing baby. Cholesterol under control: Coconut water is fat free and has zero cholesterol beverages. It increases the level of the HDL cholesterol or the good cholesterol that is present in the body. Coconut water can help keep cholesterol levels under control during pregnancy. Ease cramps, aches, pains: Pure young coconut water contains high levels of potassium – more than a whole banana’s worth in the water from a single young coconut – to help ease the various cramps, aches, and pains that accompany the early stages of caring for a newborn. Enhancing milk production: Pure young coconut water is safe and healthy as it passes through lactation to the newborn baby. Indeed, fresh coconut water is loaded with healthy vitamins, nutrients, and antioxidants for secondary consumption by the nursing baby. Coconut water is one of nature’s best foods for enhancing milk productionhas and even has similar nutients to breast milk. Natural energy: Young coconut water provides a boost in electrolytes and a healthy pinch of natural sugar as new moms take on increased levels of daily activity or exercise. Weight control: For those concerned about weight control and/or cardiac health in the wake of childbirth, pure young coconut water presents a tasty, low-calorie option that contains virtually no fat or cholesterol. Constipation and hearburn: Consuming coconut can help pregnant woman in keeping away from constipation and heartburn. Urinary tract infection: A lot of women suffer from urinary tract infection during pregnancy, which can be prevented by consuming coconut water, which is a natural diuretic. Drinking coconut water can help increase the frequency and flow of urine.